Fresh from the oven. Annie Lennox with the BBC Concert Orchestra live August 16, 2007 at the Mermaid Theatre in London. 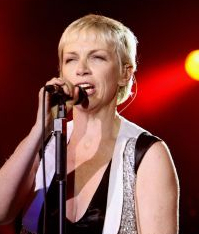 Lennox previewed three songs from her soon to be released fifth solo album, Songs Of Mass Destruction. They are Dark Road, Smithereens and Ghosts In My Machine. The single Dark Road was released August 15. Buy it here. We have Tony Blair to thank for the inspiration that went into the making of Lennox's new album, her first since Bare in 2003. Songs Of Mass Destruction is due to be released Oct 1, 2007, her first new album in four years. This show was broadcast on August 25. Click here to order the new album.